Menosan Contains phytoestrogens, which help reduce the symptoms of menopause and make women feel healthy. It also prevents occurrence of post-menopausal cardiac ailments and loss of bone density. Menosan also has anti-oxidant properties, which prevent cell damage and delay ageing. Ashoka (Saraca indica) – Estrogen deficiency puts the body at an increased risk of urinary tract infection. Ashoka has antibacterial and antimicrobial properties to help alleviate this risk. Shatavari (Asparagus racemosus) – Has estrogen-like properties and reduces menopause symptoms like depression, mood swings, insomnia, irritability, anxiety and loss of bladder control. Kukkutandatvak bhasma – Calcium supplement to prevent loss of bone density and osteoporosis. Zaharmohara bhasma – Source of natural calcium. Hartitaki (Terminalia chebula) – Reduces mood swings, anxiety and digestive troubles. Bala (Sida cordifolia) – Analgesic and anti-inflammatory properties. Helps reduce muscle and joint pain. Yashtimadhu (Glycyrrhiza glabra) – Rich source of isoflavones. Reduces vaginal dryness, hot flashes and night sweats. Recommended dosage is 1 tablet per day with a meal and preferably at a fixed time of the day. This supplement does not have any side effects of drug interactions if taken as advised. Price of the product within India is INR 100 per 30 tablets. This amounts to less than $2 for a month’s dosage. However, the company website does not ship this product to other countries. The company also has a 30 day no-questions-asked money back guarantee. Himalaya Herbal Healthcare is a known herbal supplement company in India and is famous for manufacturing effective supplements at an affordable price. 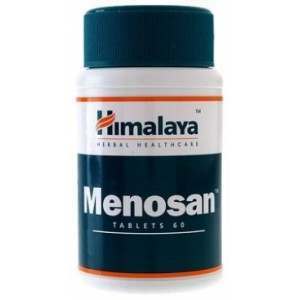 Menosan contains ingredients that are commonly used in ayurvedic medicine and have been found to be beneficial. It has no side effects. Jackie Horowitz	reviewed Menosan	on July 27th	 and gave it a rating of 3.